Would you know what to do if someone collapsed in front of you? Do you know the latest CPR rescue techniques? Would you be able to quickly recognize and help a choking individual? Learn about these rescue topics and more when you enrol in a Canadian CPR course with Ottawa First Aid. This provider teaches participants the latest ILOCR and American Heart Association rescue techniques and provider participants with training in the use of automated external defibrillators. Learn the latest cardiopulmonary resuscitation (CPR) rescue techniques using advanced equipment such as bag-valve masks, AED trainers and rescue mannequins. Get the best prices and most advanced training when you register for a food handling, workplace safety or Ontario WSIB approved first aid course with Ottawa First Aid. Use the contact information provided below to contact this provider or to inquire about the courses available to you. You can reach the Ottawa First Aid staff using the information provided below. Registration for CPR courses can be completed by using the links below. What Courses Are Available with this Provider? Automated External Defibrillator (AED) training is included in every CPR program offered with this provider. Participants will learn to use this life saving equipment with AED trainers with each CPR component of a course. This equipment is vital to the survival of victims in cardiac arrest including ventricular tachycardia and ventricular fibrillations. Learn about these techniques and more when you enrol in a basic CPR course with Ottawa First Aid. Ottawa First Aid offers the cheapest rates for all certification and refresher programs. Course rates are paid once during enrolment – inclusive of taxes, certification fees, and training manuals. Trainees don’t have to worry about additional fees during the training period. If you do not finish your enrolled course, a full refund is given as long as a 72-hour notice was done before dropping out. St Mark James training certificates are awarded to trainees who are able to complete a training course. The certificate is valid for three years and is applicable for re-certification with this St Mark James provider. Refresher courses are only applicable for individuals with current certificates from reputable providers. 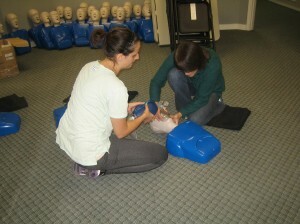 Ottawa First Aid has several training facilities throughout the Ottawa area. The training centers are easily accessible by public and private transportation, and are within walking distance to a number of amenities such as free parking and restaurants. The classrooms are spacious and well-maintained as well, providing students with a very comfortable learning experience. Sugary food like chocolate and candy, along with poor dental hygiene, is the cause of tooth decay and toothaches. When you eat sugary foods, your mouth becomes a breeding ground for bacteria who are attracted to sugar. The bacteria covers the tooth with plaque that destroy the enamel around the tooth. As the enamel erodes, the tooth develops a cavity. When the cavity gets big enough, it exposes the nerve endings in the gums, causing pain when you eat something hot, cold, or sweet.